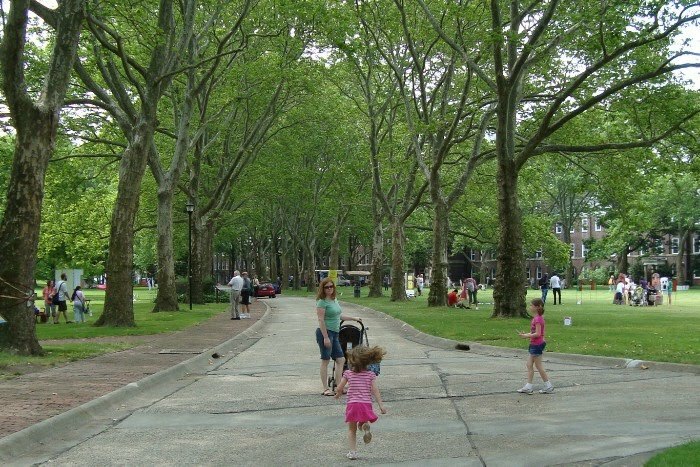 Governors Island is a little drop of land in New York harbor. If you draw a triangle between the southern tip of Manhattan, the Statue of Liberty and Brooklyn, the island is floating in the middle. It’s a small miracle. There are quiet, tree-lined streets, a 9-hole golf course, historic forts and spectacular, panoramic views of the city and harbor. It was off-limits to the public for decades because it was, first, an Army base and then a Coast Guard base. I lived there for a few years while in the Coast Guard. The Coast Guard abandoned the island years ago and now, thanks to populist mayor Michael Bloomberg, the island is open to the public on summer weekends. It’s accessible via a (free) short ferry ride from either Manhattan or Brooklyn. No motor vehicles are permitted. Just bikes. Here is 3-Year old on the (closed, unmaintained) golf course. That’s Manhattan in the distance. There are events and concerts all summer long (check the above link). 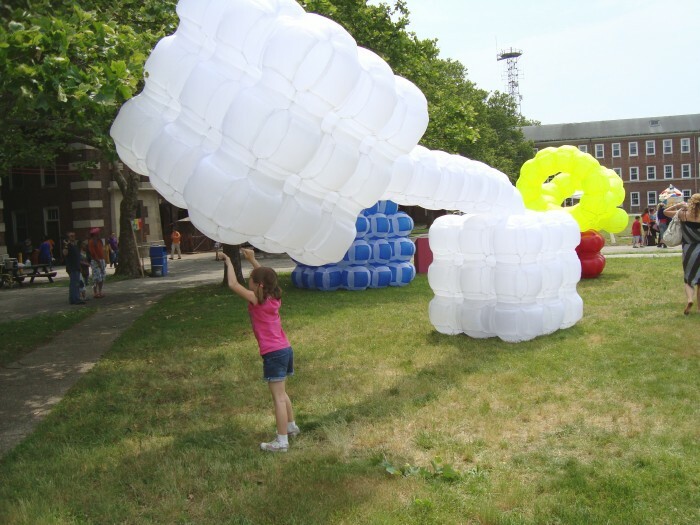 This past weekend, the annual Figment Festival was held. It’s an arts/music festival. 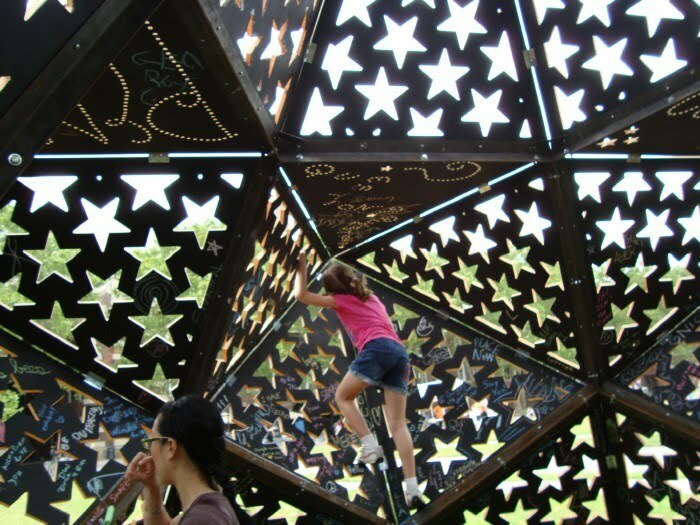 Lots of big, outdoor, interactive installation pieces and sculptures. I love the impermanent nature of the festival. The stuff goes up for one weekend and that’s it. I went a bit overboard with the photos but here’s a sampling of some of the better pieces. 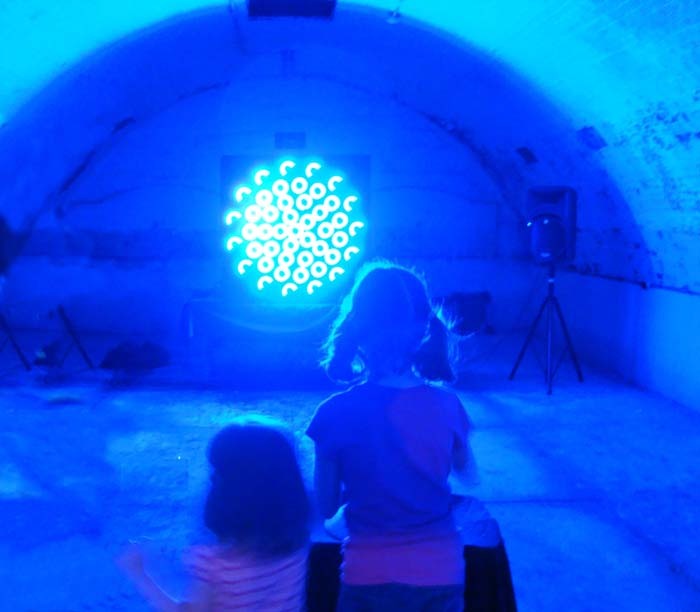 Inside the dark tunnels underneath old Fort Jay were two light and sound installations. This one allowed users to control the color and movement of the light by holding an orb containing a sensor. As you tilted the orb, the light and sound would pulsate and change color. I regret not having taken a video of this. It scared the hell out of 3-Year Old and she ran out screaming. 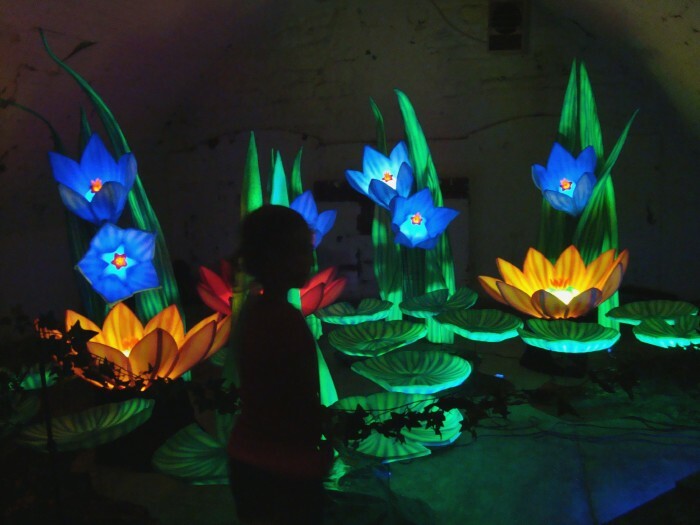 The other end of the tunnel featured a luminescent floral display. The sounds of frogs and crickets were piped in. There was a 9-hole miniature golf course. Each hole was a sculpture. 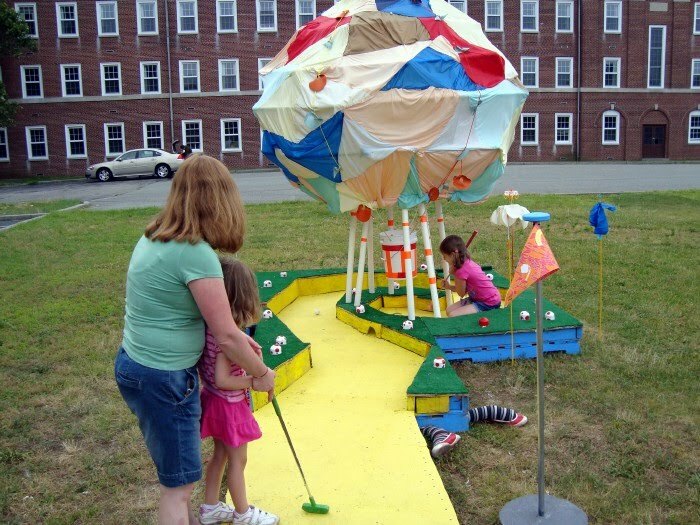 Honestly, they functioned a lot better as sculptures than they did miniature golf holes. Some of them were impossible to navigate, even for a seasoned mini golf pro like myself. This one was based on The Wizard of Oz. There’s the Wizard’s balloon, the yellow brick road and, on the right, the Wicked Witch’s feet protruding from under the house. Hole 7 was done in a cool Andy Warhol/Edie Sedgwick/Mona Lisa motif. This was a bed of roses. 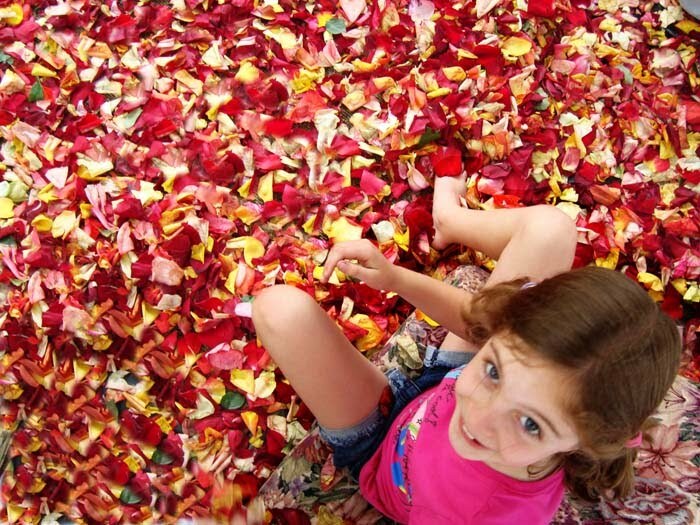 An artist who works as a florist brought a dozen garbage bags FILLED with rose petals and spread them out on the ground. 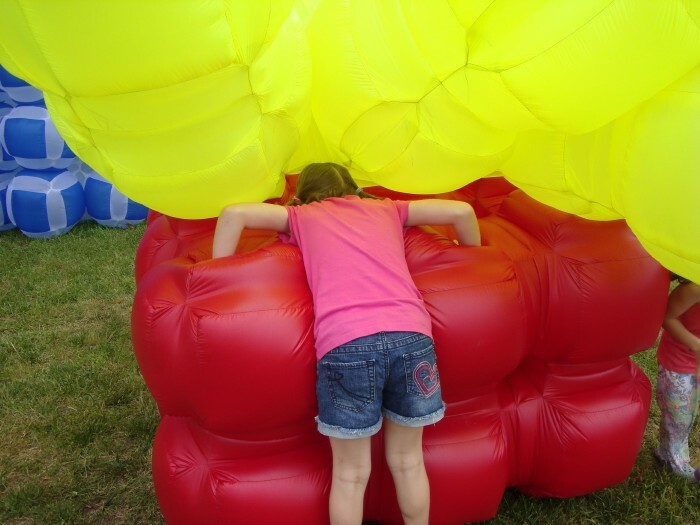 There were a few large inflatable sculptures. 3-Year Old had the odd inclination to pummel this one with her fists and then give it a few solid head-butts. What’s with the aggression, I wondered? 8-Year Old was in more of an absorption mode. This one had a free-standing end that could be picked up and toss around. After I took this photo, I pushed her aside and made her give me a turn. It was fun! 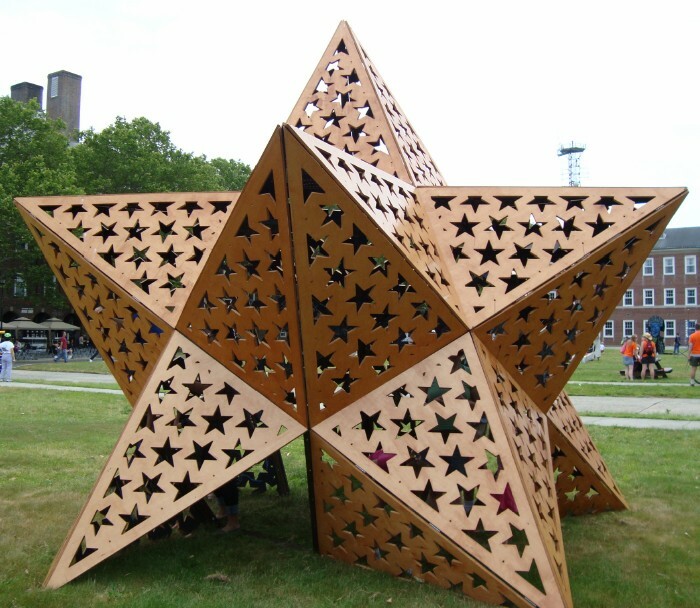 This was a star sculpture that you could crawl underneath and get inside. Once inside, there were thick pieces of different color chalk that allowed you to draw all over the interior. I would have been disappointed if there hadn’t been some bad art. 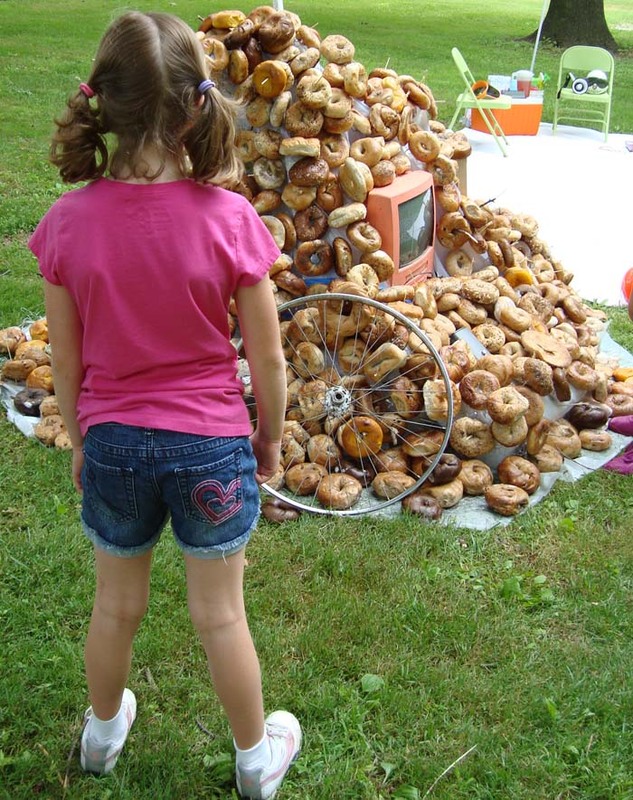 This was a hill of molding bagels with an old TV and bicycle wheel. I think they were inspired by Marcel Duchamp’s playful Readymades but it was CRAP-OLA. 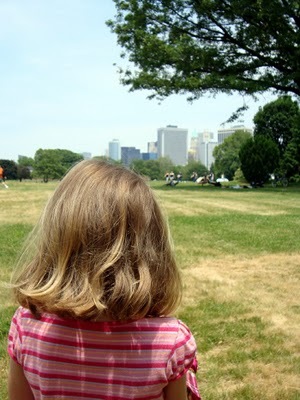 We packed a picnic and listened to some talented musicians while eating lunch in the grass. Leah, you should take a day and visit. You can rent bicycles. All you have to watch out for are the maintenance crew golf carts. And it’s never crowded! I don’t understand it! I don’t think many people know about it. When you’re on the Island, it doesn’t even feel like you’re in New York City anymore. What a very cool place!Perhaps Three year old head butted that art because of the scare from the light display??? What a cool looking place. Noted for my trip to NYC in the autumn (or fall, I guess). Any other hints would be welcomed. I’ve been looking for a nice spot for my secret lair. This is perfect. Savannah: I wish that the course had been more functional than it was but what the hell. You can’t have everything.Ponita: Nope. 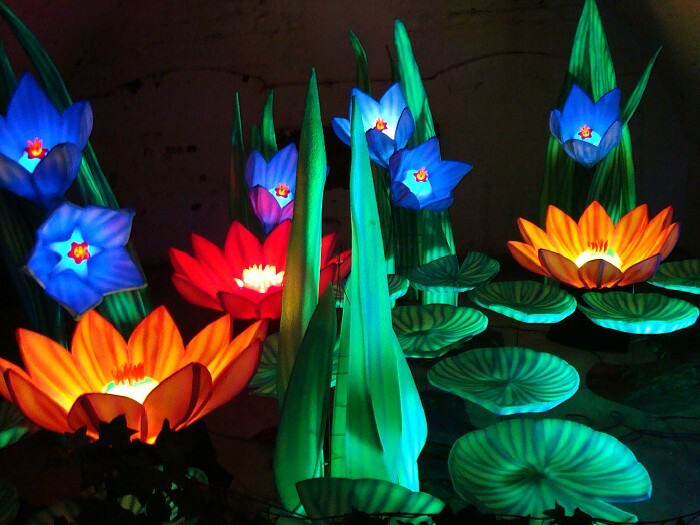 The lighting came after the sculpture. I think it’s her nature.Nutty: I’ll get to work on an agenda. Fall is a great time to visit the city.Kykn: You are an evil James Bond villain of a man. Aren’t you? Who else would need a lair? when nursemyra and i visit next summer, this will be on the ‘must see’ list! Something for all the family. A great place to know of. Daisy: I have ALL SORTS of things planned for you and Ms. Myra.Pat: I suspect a teen would have been bored but they’re still young enough to not worry about compromising their coolness.Map: After I posted this I thought maybe I shouldn’t be blabbing my City secrets around. Then I realized I barely have any readers so I relaxed. AFM: That’s worse than bad. It’s disturbing. I hope no public funds were used to purchase this catastrophe. What a fun time the girls seem to have had! Ten points for good parenting! 🙂 Just yesterday I was wishing for a bouncy castle. 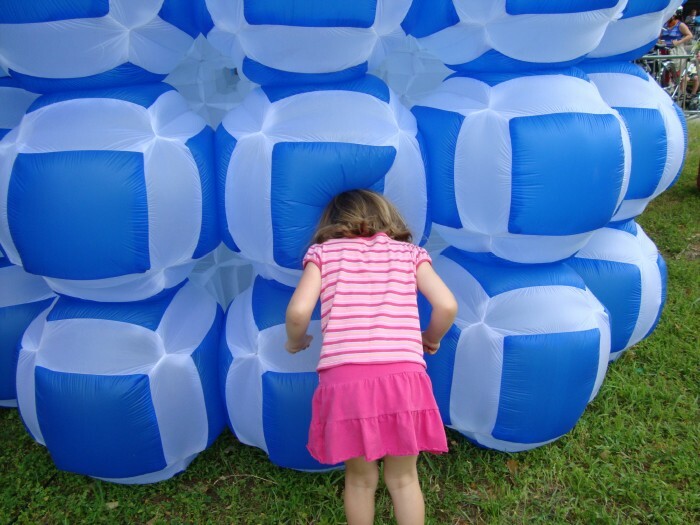 Except seeing the weather in your pics, I think I want an outdoor bouncy castle, not one of those play pens they tried to lure me with at a mall last evening. I wonder if critters come out at night and nibble on the bagels? One man’s garbage is another man’s art. That’s so cool–and of course I’ve never been there! !Sarge has though, and he’s very fond of it. We will make the little trip this summer for sure. HIF: Believe it or not, I was going to pluck one up and snack on it until I saw they were COVERED with mold!MIT: If you come across an old Jerry Lee 45, you should throw it up on eBay. That way, you could finance a trip to NYC.Leah: We’re lucky it’s open to the public. For many years, it just sat there unused.